The Battle of Cowan's Ford, which took place in northwestern Mecklenburg County, was a Revolutionary War action by the Continental forces to delay the British crossing of the Catawba River. The battle was an important part of the fight-and-retreat strategy of Gen. Nathanael Greene, commander of the American army in the South. 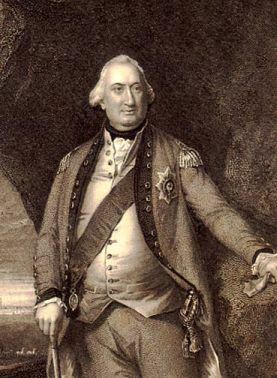 Although it was unclear to Greene exactly where Lord Charles Cornwallis, leader of the British forces, would cross the river, Cornwallis's line of march in late January 1781 indicated that he planned to cross at either Beattie's Ford or Cowan's Ford. Greene hoped that a substantial delay of the advance would give him the opportunity to select the time and place of a major battle that he saw as inevitable. He left Gen. William Lee Davidson with a relatively small force to carry out his plan after warning his younger compatriot that the wily Cornwallis would probably feign an effort at one ford and attempt to cross at the other. Greene knew his opponent well: on 31 January Cornwallis sent a detachment to Beattie's Ford, giving all indications that it was the point of entry while the main army crossed at Cowan's Ford. Davidson saw through the ruse, however, and moved the bulk of his troops to the lower crossing during the night, which surprised the British when they arrived on the west bank just before daybreak on 1 February. The Catawba River near Cowan's Ford was about 400 yards wide, with a rocky and irregular bottom that caused fluctuations in depth. Regular travelers had established two lines of direction for crossing. A wagon ford went directly across to the east bank, and a longer, shallower horse ford started at the same point but turned right about two-thirds of the way across, ran over the end of a large island, and headed toward a rocky hill about a quarter of a mile from the exit of the wagon ford. Recent rains had swollen the river, creating a swirling current, and a misty fog shrouded the area, but Cornwallis wasted no time in ordering his men to cross the wagon ford. They waded in, four to a column, with bayoneted muskets and long staffs to steady them in the rough current. Not until considerable progress had been made did the splashing waters alert American sentries, who sounded the alarm and began firing. Davidson, expecting the British to cross via the horse ford, had deployed most of his men there. Quickly responding to the sounds of battle, he led the remainder of his force to the scene, but by the time he arrived, the first British troops had reached the shore and cannons brought to the British front on the west bank had begun to pound the American defenses. Davidson ordered his men to fall back to the woods and dense undergrowth to regroup, but while trying to rally a particularly hesitant unit, a ball pierced his chest and he died instantly. With their general down, the Americans broke ranks and fled, turning the battle into a rout for the British. Greene had hoped to stall Cornwallis at the Catawba River long enough to put a safe distance between their armies. The quick British victory, however, disrupted his plan and forced him to make an uncertain race to the Dan River to cross into Virginia, where he rested his troops, secured reinforcements, and procured much-needed supplies. In a strange twist of fate, the defeat at Cowan's Ford created the revised American strategy that led to the Battle of Guilford Courthouse, which severely weakened Cornwallis's army and facilitated the surrender at Yorktown. Hugh F. Rankin, Greene and Cornwallis: The Campaign of the Carolinas (1976). "Cornwallis, pursuing Greene, crossed the Catawba, 7 mi. w., after sharp fight, Feb., 1781." NC Historical Marker L-22. Image courtesy of the North Carolina Office of Archives & History. Available from http://www.ncmarkers.com/ (accessed June 1, 2012).